The 26-inch x 11.5-inch high-flow air filter from Xen-Lux can be used with low- or high-CFM fans. It has an inner diameter of 6.875 inches at one end (other end is sealed), and a capacity of 415 CFM. This filter can be used in various environments such as indoor grow rooms and other environments that require high-quality, odor-free air. 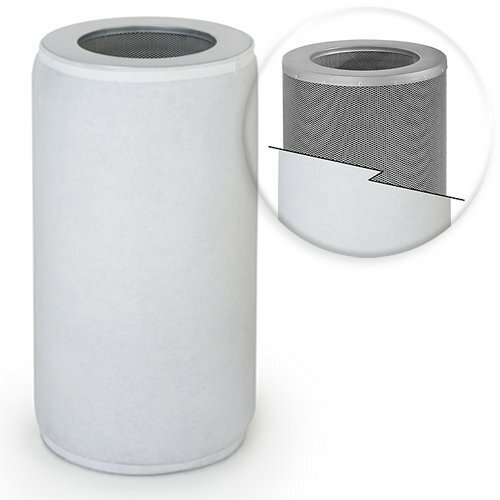 This filter removes close to 100% of organic odor and airborne particles in just one pass. Its tightly-woven pre-filter pad catches particles and impurities to keep them from entering the carbon layer. The pre-filer can be easily removed for cleaning. The filter uses highly-activated virgin carbon granules for superb odor absorption. Unlike smooth-cut pellets used with other filters, the carbon granules used with this filter are rough-cut. Smooth-cut pellets might allow the air to pass around the carbon, offering minimal odor absorption. The natural rough-cut edges on the carbon in this filter forces airflow to stop and change direction as it impacts the diversely shaped carbon facets; this allows the filter to be more effective at 'catching' and absorbing the odors as they pass through the 2-inch thick carbon field. Heavy-gauge expanded mesh caging contains the carbon. The wide openings in the mesh provide superb airflow and maintain even pressure throughout the filter body. This makes sure that 100% of the carbon is utilized without needing to reverse the filter at the mid-life point. Includes premium activated-carbon air filter and installed pre-filter. Fan, flange and ducting sold separately.